The finish was very simple. First, I made the ties. I used some of the leftover ground cloth – the area left unworked because it was too close to the edge for easy application of my hoop frame. I cut two long strips, about 14 inches long x 1 inch wide. (One strip is set aside to make the ties for the second forehead cloth). I finger-pressed down the two ends, then folded the strip in half longitudinally, again finger pressing to set the center fold. Then I folded the two long raw edges down to meet in the center. I pinned the strip and did a tiny overhand stitch hem to fasten it in final configuration. This website shows a handle folded with the same logic I used for the ties (minus folding in the ends first). Finally I cut the strip in half to make the two ties shown. I used linen thread, so the sew-up is extra invisible. To line the piece I used preshrunk cotton muslin. 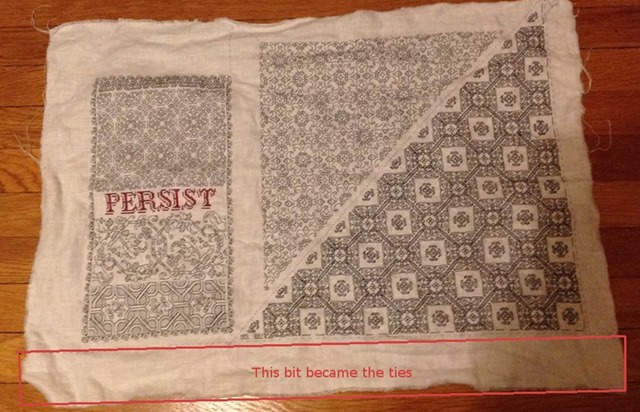 Were I concerned with total artifact level authenticity, I might have opted for handkerchief weight linen, but that level of re-creation isn’t my concern. 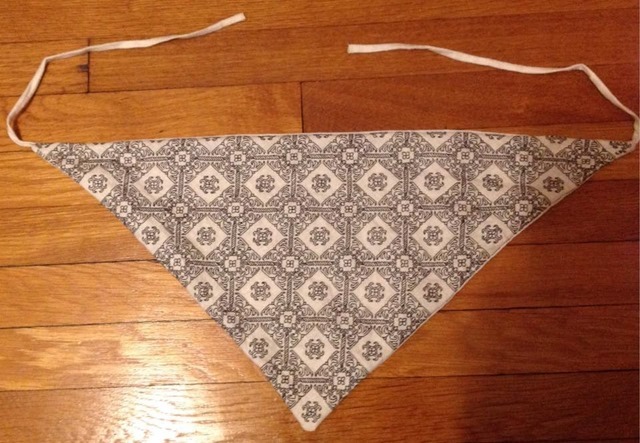 I cut a muslin triangle slightly larger than my forehead cloth for ease of stitching, and pinned my cloth to it with the finished side inside. I positioned the two laces inside the resulting “sandwich” with their cut ends protruding slightly at the two corner points. Then using my linen thread, waxed, I did a hand back-stitch all the way around the perimeter, leaving a three inch gap on one of the non-hypotenuse sides, adjacent to one of the laces. I made sure to fasten the laces in securely with extra stitching. After the hand sewing was done, I trimmed back the muslin seam allowance somewhat. Then I turned the whole thing right side out and pressed it, before closing the gap with some more invisible overhand hemming. Yes, I could have done the sew-up on the machine, but it was actually easier to do it by hand, so I could ensure my seaming was right on the edge of the countwork embroidery. Others may be more accurate with their sewing machines than I. Now – as to the stuff on the rest of the cloth. Obviously there’s Forehead Cloth #2, which I am finishing out right now in exactly the same way, plus the doodle sampler, also done. Since the edges on that are so irregular and on one side – so narrow, I will have to edge that out with some sort of mitered or butted edging cloth, then either frame it or make it into a hanging. More on this sampler in a later post. 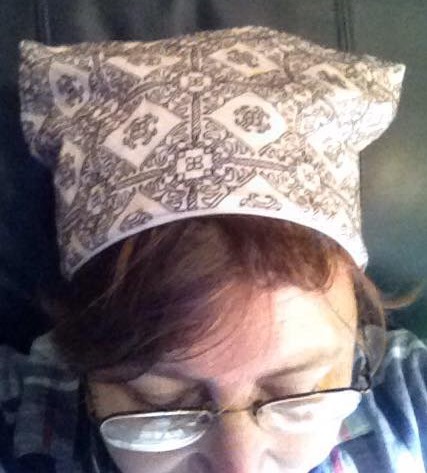 Is wearing this headcovering a religious obligation? No. I made it because I need to keep the hair out of my eyes in the wind. I wanted something a bit nicer than a bandanna, just for the fun of wearing something a bit nicer than a bandanna. I respect those who wear headcoverings out of obligation, but that wasn’t my intent. You’re SCA, why aren’t you going to enter this in an Arts & Sciences competition? First of all, I’m only borderline active these days. My heyday was AS VIII-XVI, roughly 1975-82. Even in the SCA, I’m an artifact of the past, and have no energy to engage in the current organization at competition level. But I still adore historical stitching, and as you can see, try to do it as often as possible. The challenge of making a “dual world” piece – one that I could if I so desired, wear to an event, and that I could ALSO wear in the non-SCA mundane world was sufficient challenge for me. Ground cloth: Big box store even weave linen – probably a linen cotton blend although it was not so marked. 32 count, more or less. The brand name was MCG Textiles. I do not recommend it: Slubby, surface matting, thick/thin threads that skewed the count in some areas but not others. Embroidery thread: Black filament silk, four ply, hand dyed using logwood and iron (historically appropriate recipe and method) from the Golden Schelle Etsy shop. This piece uses the entire 4-ply thickness, others use one or two plies. The proprietor is a small batch dyer, so goods are available intermittently. Some minor crocking on my beeswax, but none on my hands, and only minimal residue in those inevitable spots where I had to pick-out and redo errors. Very smooth hand, strong, and un-fuzzy finish, stitched up neatly and quickly. I like this stuff more than commercial silk floss (like Au Ver A Soie), and hope the dyer makes LOTS more. Hand sewing thread: DMC 100% linen embroidery thread from my stash. A discontinued and lamented product. Lining fabric: The best grade of 100% cotton muslin available at my local fabric shop. Nothing special. Washed and shrunk prior to using. No pattern in particular for the cloth itself. It’s a right triangle. I noted that historical examples ranged from around 13” to about 18” across the hypotenuse. This one is 17” in that dimension. The other one that I am finishing out now is about 15”. If I had a do-over, I’d make the thing an inch smaller because the points just meet at the nape of my neck. Tying would be neater and easier if there was a bit more room to do it. The stitching pattern is an original adaptation. I tool a strip design appearing on a sampler in the collection of the V&A museum and played with it, transforming it into an all-over. The original is in TNCM, the adaptation will be in T2CM. it’s lovely, and you stitched it so fast! I thought, the entire time you were embroidering this, that a forehead cloth lay on the forehead, with the point between the eyes!